This is nothing new, right? 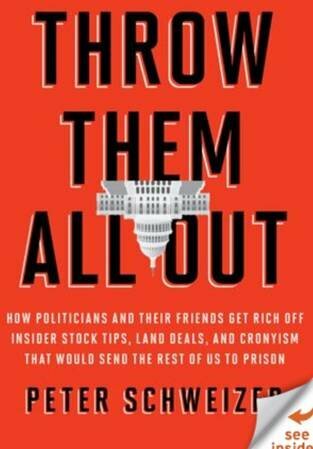 We all know that for a very long time us taxpayers have been funding just about every pet project of some corrupt, fascistic politician and all his or her crony buddies for personal gain and political votes. Here’s another look at the hegemony thriving in this country, when powers of the industrial complex wield their control over government, forcing the government’s hand, which then becomes the responsibility of contracted citizens (you and me) to pay taxes and more taxes to fund the criminal enterprise – and liking it. One such example is found in an article at the Wall Street Journal. Unfortunately this article is behind a paywall. Yvon Chouinard, founder of Patagonia, it turns out, spends lots and lots of time and money lobbying the Federal Government to do things like TAKE more and more land from the states/people for the main reason to have more and more land where his customers can do things like hike and camp and rock climb, etc., which places him and his company in a position to profit monetarily. The Federal Government taking land is nothing new. But are they really taking it? I’ll leave that discussion for another time. The problem with this scenario is that the contracted citizen is left with the bill to subsidize the company of Patagonia by providing its customers a place to play. The more places to play the more money Patagonia stands to make. In addition, if companies like Patagonia can continue to successfully lobby the Federal Government to restrict use of those lands to only the activities of which they provide gear for, all the more money and exclusivity. The taxpayer’s responsibility grows however. We know that the Federal Government is seriously in arrears in maintenance and upkeep of the land they already have in direct control. The cost of such maintenance falls on the taxpayer. The Federal Government needs at least an additional $20 billion dollars each year just to keep up with the federal land maintained. It seems ridiculous to keep adding to the shortfall by taking over more land…unless of course the powerful Industrial Complex forces presidents, like Barack Obama, to keep creating national monuments, perhaps knowing full well that Congress would not approve taking over more land for more parks. Or maybe it’s not forcing anybody to do anything. Aren’t they all in it together? We know that just before Obama left office he designated two new national monuments – Katahdin Woods and Waters in Maine and Bears Ears in Utah. 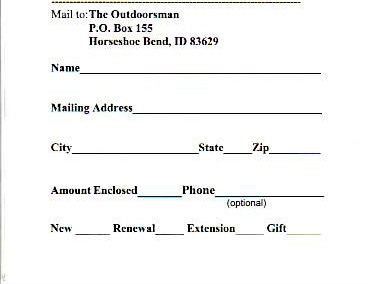 We now know that Chouinard lobbied Obama very hard to get the Utah national monument in order to pad his own wallet at our expense. In both cases, Maine and Utah governments are working hard to get President Trump to somehow overturn the designation of the two monuments. It appears quite clear that the majority of the people did not want either of the two monuments but the Federal Hegemony cannot be reeled in. In addition, the author of the WSJ piece suggested that a solution to this problem would be to implement an excise tax on camping, hiking, mountain biking, rock climbing, etc. gear, similar to the Pittman-Robertson excise tax on shooting and hunting gear, and the Dingell-Johnson excise tax on fishing gear, to fund the upkeep of federal lands and/or to get that section of the outdoor sports and recreation industry to begin paying their way. I’m not so sure that this would actually solve anything and might create more problems if not implemented properly. Otherwise, the present act of federal takeover of land and lobbying efforts would not bring into check the hegemony but might expand it even further. I would have to examine this very closely. Toni Townes-Whitley, Princeton class of ’85 was a classmate of Michelle Obama’s. They are both members of the Association of Black Princeton Alumni, and in school were both in the groups Organization of Black Unity (OBU), and Third World Center (TWC). Townes-Whitley is a senior vice president at Canadian company CGI Federal, which earned the contract to build the (so far) $678 million Obamacare enrollment website. Here’s an interesting scenario. If a town can be fined for not preventing dogs from killing protected birds, can owners of windmills be fined for not preventing their machines from killing protected birds? 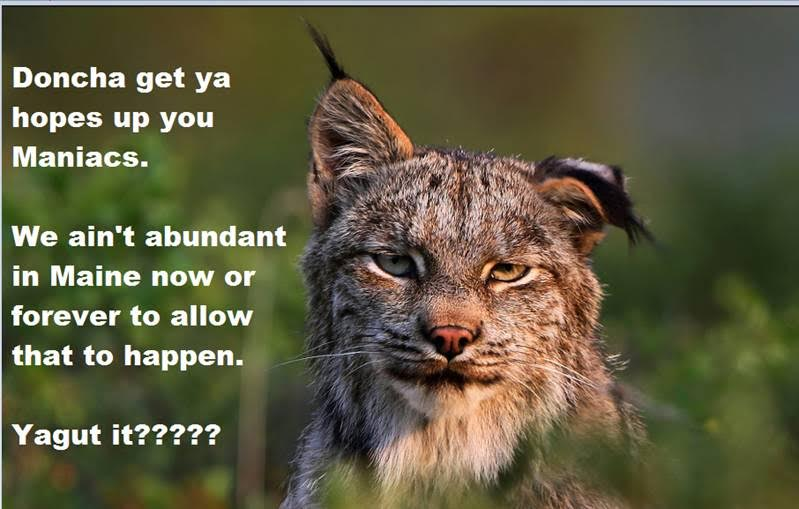 The events in Scarborough, Maine should open people’s eyes to the dictatorial fascism of the Endangered Species Act and the reality that there is no such thing as state of local governmental sovereignty. 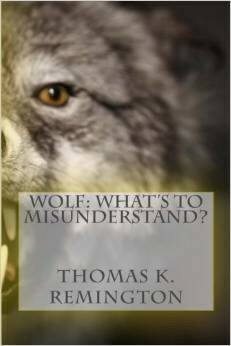 Especially when it comes to protecting animals and who is responsible for it. Protecting people? Not so much. Piping plovers, a federally protected bird that the state of Maine and the Federal Government spend far too much money trying to protect (actually the goal here is to drive people off beaches), is part of this scenario. According to the Scarborough Leader, the U.S. Fish and Wildlife Service (USFWS) plans to levy a $12,000 fine against the town because they can’t stop people from letting their dogs run loose. This action is being blamed for the deaths of piping plovers. 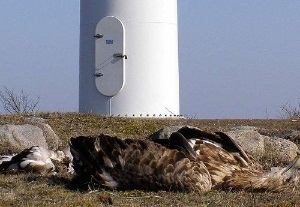 If the USFWS or any other federal agency can levy fines against towns for not doing the work of the government, or if you don’t like that statement, for NOT PREVENTING deaths of birds, then shouldn’t the owners of windmills be fined as well for the same reasons? 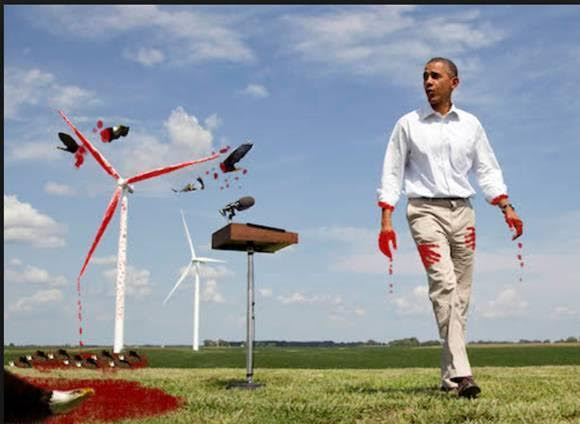 Fox News is reporting that windmill farms across the country are responsible for the deaths of at least 85 bald and golden eagles, most coming from one farm in California, and yet the Obama Administration refuses to levy fines against the owners of windfarms. 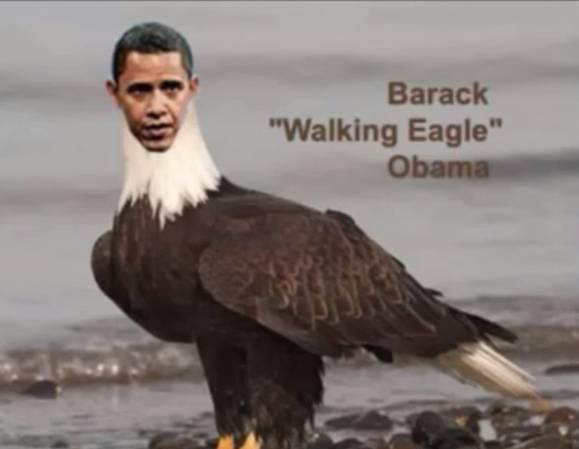 Instead, he is proposing something similar to an “Incidental Take Permit” allowing windfarm owners to legal kill a prescribed number of eagles each year. If that is the case then I suggest that President Obama issue the town of Scarborough, Maine an “Incidental Take Permit” for piping plovers. Or is it that Scarborough isn’t one of Obama’s cronies entitled to the many special privileges he loves to hand out? Is Wind Energy About Clean, Alternative Energy or Greasing Palms and Crooked Politicking? Hat tip to Richard Paradis for providing the information for this article. Maine is like many states that have been bombarded with the construction of intrusive, environment-destructive wind turbines, all hiding behind the image of providing alternative energy, lowering energy costs and saving the planet. 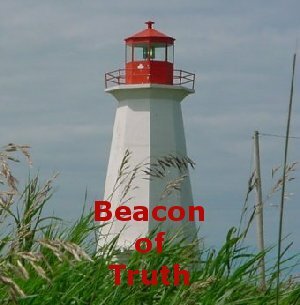 Those who have had the nasty turbines planted in their back yards are finding out that all the promises made about how quiet and unobtrusive they are were false. In addition, while the entire efforts were billed as a cost effective alternative to carbon polluting oil and coal, over time we are finding out that much of the goings on behind providing funds to promote more wind energy, is nothing more than political paybacks by the Obama Administration from the 2008 campaign. With a new election coming this year, what kind of palm greasing can we expect? 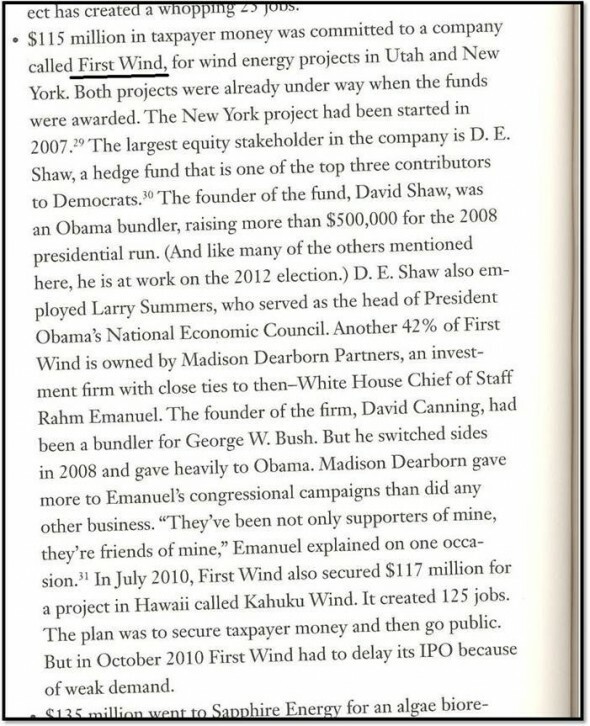 From the book, “Throw Them All Out”, by Peter Schweizer, on page 94 we discover that Obama gave $115 million in taxpayer money to a wind energy company First Wind. People of Maine, Utah and New York in particular are familiar with First Wind. The chart below shows a listing of people who were large contributors and/or bundlers to the Obama presidential campaign in 2008. For Maine residents, take notice that former Gov. Angus King and now owner of Record Hill Wind, received $102 million in taxpayer money to build his wind farms. The center column shows the energy companies, i.e. 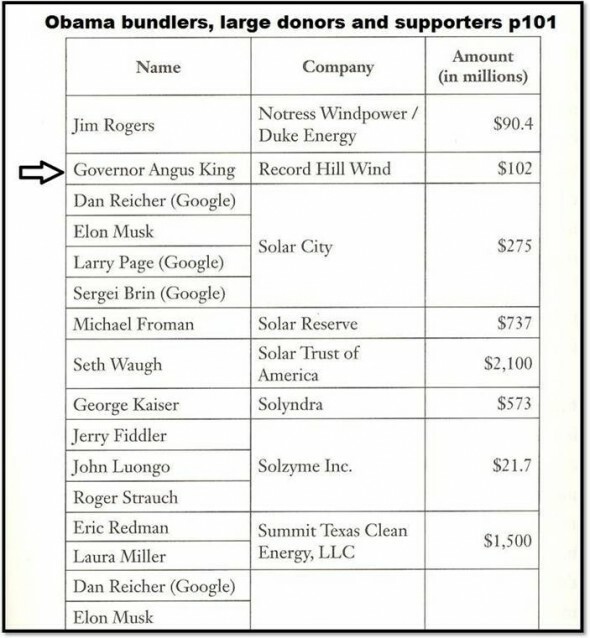 wind energy, these donors own. In the right hand column is the amount of tax dollars kicked back to these donors by the Obama Administration after the election. So it’s all about clean energy is it? I would put into action exactly what the title of the referenced book says: Throw Them All Out!